What lies beneath a character's behavior? Find out how you and your characters operate as a "System of Selves" at our newest Character Mapping Intensive the weekend of November 18th and 19th on the campus of AFI. Join us on Saturday and Sunday from 10-6pm and learn how both you and your character's inner voices operate and motivate. You'll get psychological tools to make sense of yourself and any character - no matter how crazy or unrelatable you or they seem. We'll dive deep to navigate the complex network of inner selves we all have and identify the burdens and gifts that drive our motivations. A variety of personality typing systems are offered to create a multi-faceted character while avoiding stereotypes. There's no better toolbox than Character Mapping for creating characters and finding your Self. You'll also learn self-care practices so, as a storyteller, you know where the characters end and you begin. Go to www.Character-Mapping.com to register today! 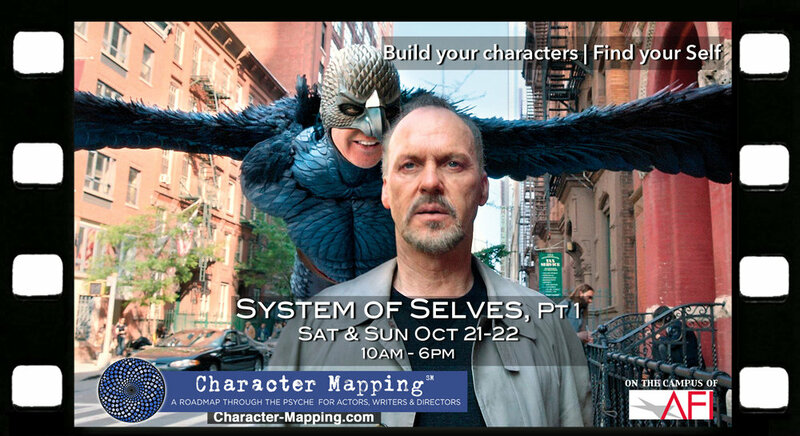 Find out how you and your characters operate as a "System of Selves" at our newest Character Mapping Intensive the weekend of October 21st and 22nd on the campus of AFI. Join me and the character mapping creator Mariel Pastor August 12th & 13th in Los Angeles on the campus of American Film Institute for Character Mapping: Family Legacies and Social Roles. Learn how to quickly create a family tree reflecting relational dynamics and the influence of ancestral legacies. We'll take a close look at the psychological impact of common adaptive familial and social roles in childhood and adulthood and map how that will play out in your story. This course will transform your creative practice as well as your life. You'll receive essential tools from modern psychology, mindfulness, and systems theory for your characters, your craft and your self. Learn how to "think like a therapist" and flesh out the primary domains of a character's life with understanding and compassion. We'll be including current findings from neuroscience, new perspectives on common health diagnoses, and the underpinnings of trauma. Learn all about Integral Theory, Johari's Window and an introduction to The System of Selves.